It’s no small matter when BMW rolls out an all new 3 Series, not only does the car represent BMW’s bread-and-butter – it represent 50% of all bimmers sold – it’s also the benchmark upon which every other entry-level luxury sedan has been judged over the last 30+ years. For 2012, BMW made the new 335i faster, more fuel-efficient and gave it a controversial but in my opinion beautifying face lift. A new 3 Series face features bright Xenon adaptive headlights with the signature coronas that pour inward toward the iconic chrome-wrapped grill. The front bumper is broad and blunt-faced giving the car a menacing grimace-like overbite which pours over the lower grill. Into the sides and rear the car looks much more familiar, even with the 3.7 inches of extra overall-length and 1.9 inches of additional wheelbase. The wheelbase extension is noticeable, especially when you take a seat in the rear where you get some extra head room and a little more knee space. 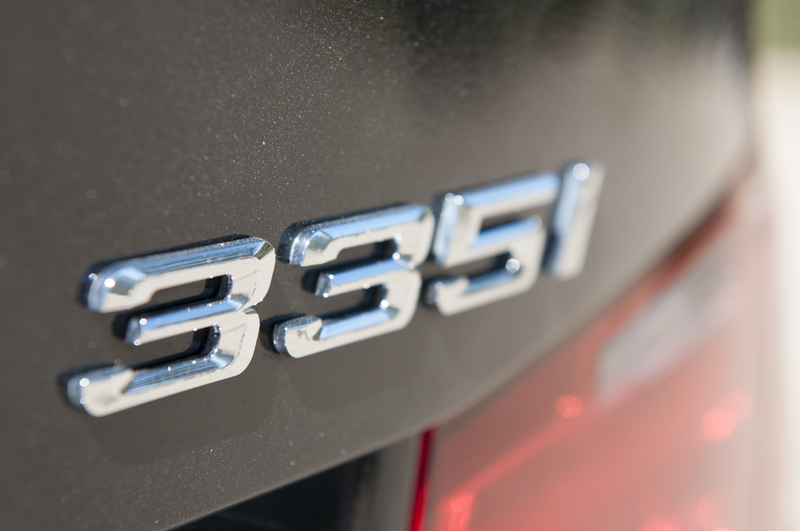 The new 335i is powered by a turbocharged N55 3.0-liter inline-six good for 300 horsepower and a satisfyingly symmetrical 300 ft-lb of torque. I had the pleasure of reviewing the six-speed manual, an 8 speed automatic option is also available. The manual operated beautifully, the tautly sprung clutch and shifter work in perfect unison to offer up smooth shifts whether you’re in stop-and-go traffic or whipping up a steep canyon road. When you pair smooth shifting to the fantastic shifting and precise steering of the 335i you can’t help but find yourself smiling. Dash controls and vents are in roughly the same places as the previous model the panel however received several much-needed updates. 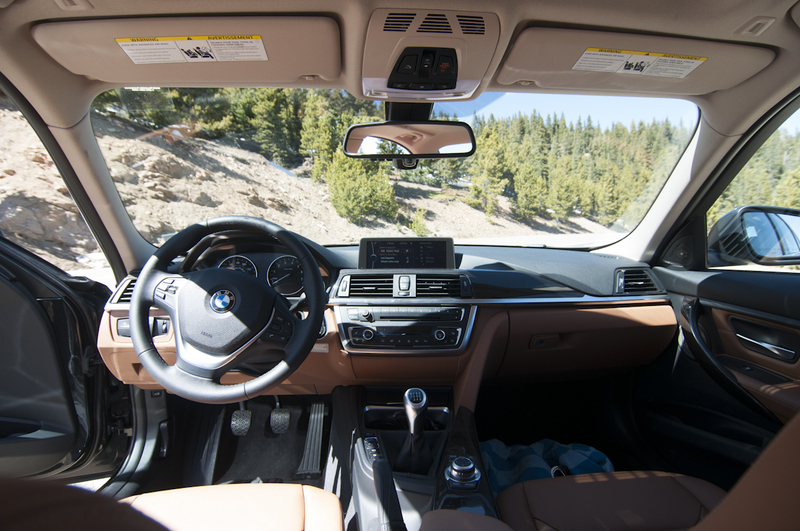 The 2012 335i gets a more pronounced and readilyvisible instrument panel, a pull-type parking brake and a user-friendly driver oriented center console with a spacious 6.5 inch flat screen adorning the top. The new iDrive is an easy to navigate multimedia powerhouse allowing you to use GPS navigation, play music from nearly any source, make and receive calls, search the vehicles user manual and more with a user-friendly layout and simple to use controls that won’t distract you from the driving experience. Unfortunately, the 6.5 inch screen doesn’t retract and it just doesn’t fit into the landscape of the dash well at all. Overall, the memories of the disaster iDrive once was are now fully faded. This is a truly outstanding system and iPhone integration is second to none with an optional dock hidden away in the center console. 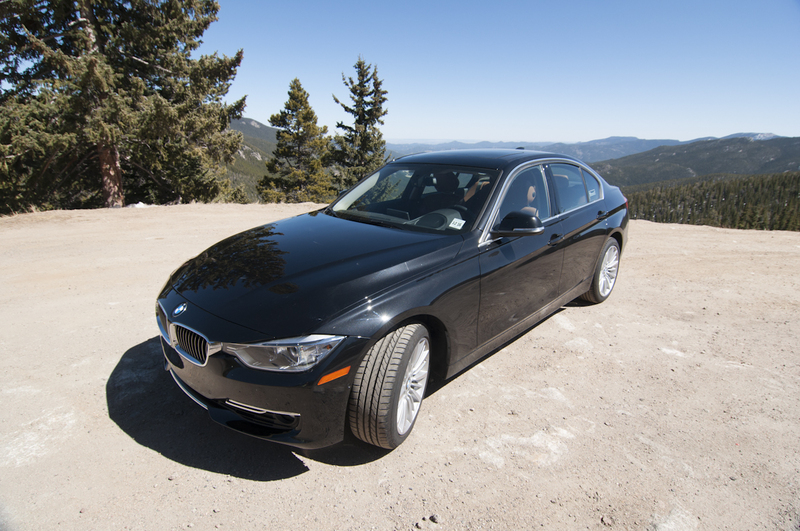 The 335i loves being hurried up a winding canyon, showing the quick pace and tight handling of its predecessors. 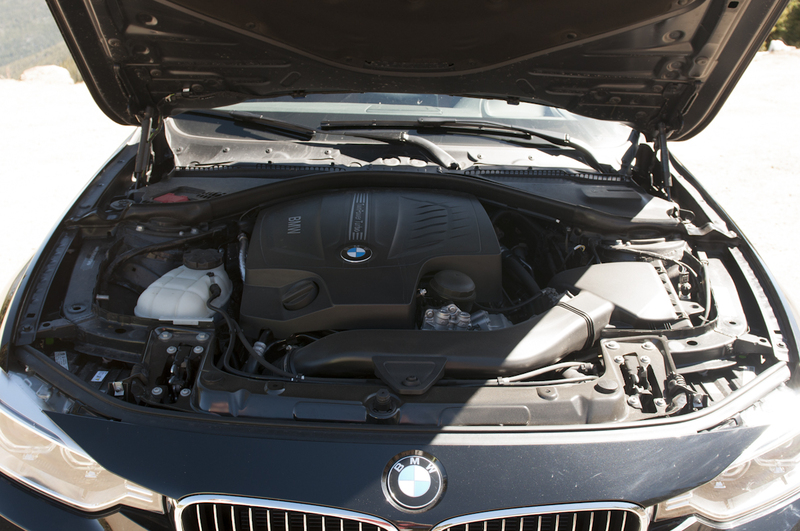 The 335i quickly laid aside concerns regarding its new electronic steering, the 335i’s still got it. The steering is still tight and still perfectly precise though the steering feedback did seem a bit more subdued. The rack-and-pinion setup easily tunes out rough surfaces without sacrificing control or handling. I did, however, notice that road noise was louder than expected with a surprising amount of tire noise audible from the cabin. The 335i was slightly slower than expected when I pushed it to 60. It needed 5.3 seconds as opposed to the high 4s I expected. The time could’ve been due to being at altitude here in Denver. When coming to a stop the car performed perfectly with every stop coming in under 170 feet. Playing with the Driving Dynamics Control (DDC) I found that the Comfort setting offered up a little too much steering assistance. In Sport or Sport+, however, steering felt perfectly natural and precise. There’s also an Eco Pro setting that profoundly reduces throttle control, thusly saving fuel. The 335i also comes with the option of Adaptive M suspension ($900) which adds electronically variable-dampening to the shocks via the DDC setting. Although my car didn’t include the option, I never found that the ride quality or handling was ever any less than excellent even when I put the car into Sport+ mode which effectively amps up the throttle and cuts out the traction control. There is an upcoming optional M Sport package which will drop the ride height by half and inch and ride on firmer, non-electronic shocks and stiffer springs. Another interesting feature in my 335i was the heads-up display which is part of the optional technology package. The system uses a small projector under the top of the dash to display information to the driver on the lower portion of the windshield. The system proved itself quite useful and practical allowing me to check my speed and change radio stations or tracks from my iPhone without looking away from the road. Our car came with the Luxury Line package which came with an outstanding sport leather steering wheel, 18″ light alloy wheels, very nice anthracite wood trim and pearl highlights. The interior was covered in dakota saddle brown leather which contrasted nicely against the upgraded black metallic sapphire exterior. Fit and finish throughout was top-of-the-line and unquestionably luxurious. Our vehicle also came with the parking package which includes a rear, side and top-view cameras and park distance control. When combined with the 6.5 inch screen the parking package is easily the best I’ve used. The cars premium package offered up comfort access keyless entry, a universal garage door opener and auto-dimming mirrors. The cars upgraded Harmon Kardon sound system was outstanding and pumped my iPhone playlists with ease. The 2012 BMW 335i starts at $42,400 plus $895 for destination and handling. The Sport, Luxury and Modern Lines vary in price. Our car had the following upgrades: black sapphire metallic paint ($550), luxury line ($1,400), parking package ($1,550), premium package ($1,900), premium sound ($950), technology package ($2,550), split fold down rear seats ($475), heated front seats ($500), BMW enhanced BT and USB ($650) and BMW Apps ($250) the options add up quick and all together the total for our car came to $54,070.